Supernumerary teeth (ST) are uncommon alterations of development that may appear in either of the dental arches and that are frequently associated with syndromes such as cleidocranial dysplasia and Gardner syndrome. Multiple ST in individuals with no other disease or syndrome are very rare. In view of this situation, correct diagnosis, treatment and evaluation of ST with the use of appropriate imaging techniques are highly important. This case report presents radiographic images of a nonsyndromic 12-year-old female patient who presented with 14 supernumerary teeth and was treated under general anesthesia, with the extraction of all ST in a single surgical intervention. During the postoperative period, the patient did not complain of pain nor did she present any signs or symptoms of infection. 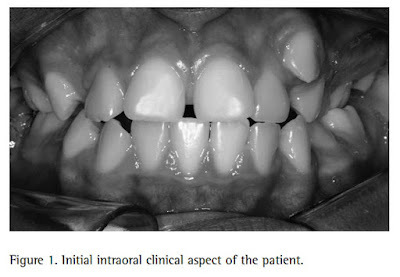 During late follow-up period, due to difficulty in traction of the maxillary right canine and mandibular left first premolar towards the dental arch, it was necessary to extract these teeth under local anesthesia. Radiographic examination 3 years after surgery revealed the absence of ST and of diseases related to the existence of these teeth.